The idea of dropping everything, selling homes, and moving to a blank-slate piece of property in rural northern California to rescue farmed animals is not for the faint of heart. In fact, it sounds downright frightening! And yet that is exactly what Kim Sturla and Ned Buyukmihci did in 1988 – both sold their homes, emptied their savings account, and purchased 60-acres of raw land in Vacaville, CA. No septic. No electricity. No fences. No barns. No permanent home. No phone. Only a trailer and the conviction that what they were doing was right. For Ned, a veterinary ophthalmologist and professor at UC Davis, providing sanctuary to rescued farmed animals not only helped those individuals but also offered him a respite from the barrage of anti-animal sentiment at research-rich UC Davis. 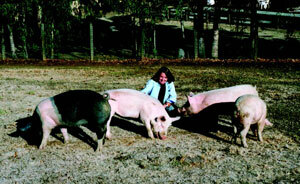 As an employee of a local dog and cat humane society, Kim saw firsthand her colleagues’ disconnect toward farmed animals. While moving to their new home in Vacaville, the shelter took in a pink farm pig. The shelter staff named her Zelda and doted on her. “We’d all take breaks and visit Zelda in her straw-filled dog kennel and feed her peanut butter sandwiches. Everyone loved her.” But when it came time to find a home for Zelda, the only offers came from people interested in slaughtering and eating her. Kim and her colleagues knew this was unacceptable and they refused to adopt her to anyone interested in killing her. That year, 1989, Zelda became the first official resident of newly incorporated Animal Place. It had taken a year to build fencing and the first barn, but the refuge was now ready for residents. For the next ten years, Ned and Kim would be the sole caregivers and funders, volunteering at the sanctuary while working full-time jobs. What started as volunteer-run, small sanctuary has over the years transformed into one of the most respected sanctuaries in the country. For years, Ned and Kim had done more than simply care – the sanctuary was a physical reflection of their compassion in action. 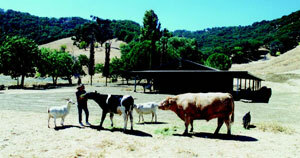 Today, it is a model sanctuary with two facilities (600-acres in Grass Valley, and the original 60-acre site in Vacaville), 14 employees, a cadre of volunteers and interns, and tens of thousands of supporters. But in the beginning, it was just Kim and Ned, their pups, some raw land, and a germinating idea of making something important for farmed animals out of nothing.